So the William Jefferson Clinton library opened today. Whether they wanted to or not, the Carters and all four Bushes were in attendance for the opening ceremony. This picture, which I would have flagrantly reprinted without permission if My Way News allowed me to download images, shows the four First Ladies. I think there's something perfectly iconic about this picture of these women carrying umbrellas. I'm not sure what though. 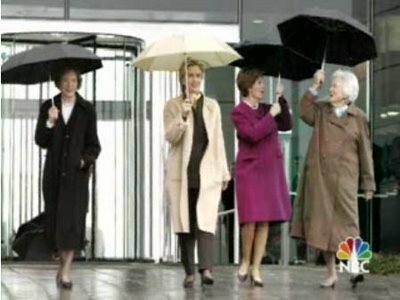 Maybe it's that Hillary is carrying the only white umbrella. Maybe it's that Laura is the only one wearing pink — and at that, she's wearing the pinkest pink she could get her hands on. Maybe it's Laura and her mother-in-law's apparent amazement at the function of their umbrellas? And just maybe it's Rosalynn Carter putting as much distance between herself and the other three as possible while still remaining in the shot. I'm doing a story for someone where in a post-Alice wonderland the other suits of cards try to rise up and take the throne for themselves. Cival war ensues.